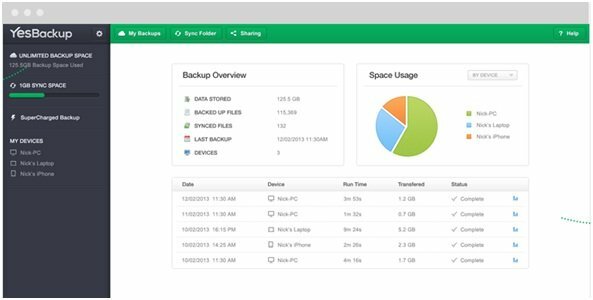 YesBackup Review – Is $1 for 100GB for Real? Why should you choose YesBackup to be your personal cloud storage and what can they offer you? If you haven’t know yet, YesBackup, JustCloud and MyPcBackup are all from the same company. Still the new apple icloud reduced pricing of 50GB to $0.99 can’t beat this yesbackup attractive package. This review of YesBackup should explain why this is one of the best choices when it comes to safely and easily storing your files. I have thoroughly tested it and weighed the features versus usability to conclude for you if it’s one of the top choices. You need a product like this if you need to back up documents, images or videos, or any other types of files that should be safely stored. Computers get viruses and crash, phones and tablets break, and sometimes life just gets in the way and you’re faced with a stolen item situation. Without properly storing your important files and precious memories to a place like YesBackup, they are gone forever. You also want to have a simple and accessible place to share and open files from any device, either so you can access them from multiple devices or so you can share them with other people’s devices. In conclusion, file sharing is perfect for businesses, friends and families who want a one-stop place to access, view and edit files. Who is YesBackup? Never Heard of Them. YesBackup is a free service for backing-up files such as photos, documents, and music all online. YesBackup can be accessed anytime and anywhere. The user can sync multiple devices which is beneficial for use on the computer and mobile or for multiple users to store and share files. Did you know that YesBackup offering 100GB for only $1? File storage and “the cloud” can often sound confusing to some. But the process of backing up files is rather simple. You just choose which files you want stored, upload them to YesBackup where they will become backed-up on their app, and that’s it! You can access them anywhere and know that they are safely stored in the cloud. How do they keep files secure? They store data using Google Cloud Storage servers—the most reliable and comprehensive storage provider on the Internet. This company promotes a secure, simple process where they will protect your files through all stages of transfer, storage and download. The Google servers they work with are physical secured. And all data is secured in multiple locations which minimizes the chance of data becoming lost. All data is encrypted by YesBackup. There is an option to encrypt data before uploading it using any free application for that but it is not necessary. All employees of YesBackup comply with a strict policy and cannot access any file content. In short, only those you choose to share files and folders with will be able to view them. Did you know that YesBackup is utilizing Google Cloud Storage Server? A complete data security is necessary when it comes to file storing and file sharing. Putting top secret files or personal photos and videos online can be a scary thought. That’s why the best data security is important. YesBackup has servers in state-of-the-art data centers around the world which guarantees that there is no single point of failure. Plus, all files are stored with 256 bit encryption which is the same that banks and governments use.The 128 bit encryption option is often used with businesses and other programs but here you will have the top-notch 256 bit encryption. It will also show you which user is using the most space in a color-coded, easy to read chart. Then there is also a more in-depth summary at the bottom of the page showing each item (document, photo, music, etc.) that has been stored, the size, when it was stored, and so on. This is a 100% automated backup. YesBackup has a strong technical support team. They have a sales support ([email protected]), technical support ([email protected]), and billing support ([email protected]) to quickly reply to any specific questions. They also have a general inquiry option to contact them via email, phone call, or mail. Alternatively, they have a fully stocked FAQ page so you can learn to troubleshoot on your own or quickly find an answer on the FAQ page. Having a strong customer service with any type of product is always important because it shows intelligence, integrity, and value for the customer but strong customer service and technical support is extra important with cloud storage because users often need an answer right away, whether it be to find a file, delete personal information, or change a setting. They are at your service 24 hours a day, 7 days a week, 365 days a year. Conclusion: Is YesBackup The Bargain You Looking For? A little iffy about investing the money right away? Check out this deal. There is a special offer running for $1. Just one dollar will get you 100 GB worth of files backed-up safely. That’s the equivalent of 27,000 songs or 11,000 documents. There are also a ton of a la carte options, if you will, and an auto-renewal service which helps you guarantee no files are ever without 100% automated backup. In conclusion, YesBackup is simple, secure and affordable. It’s highly recommended. Did I mention that Yesbackup is offering 14 days free trial?